August 11, 2014 By Tina M 3 Comments This post may contain affiliate links. Read my disclosure policy here. If you remember my earlier post about my daugher’s moldy bath toys, I now boycott any type of bath toy that has a hole in the bottom of it. No more rubber duckies, no more squiriters, they just aren’t worth the hassle. Here is a list I have started to make, of top-rated bath toys that don’t have holes (as far as I am aware). Whenever I need a filler item on my Amazon Prime order, I like to add a new bath toy. It’s been awhile since we’ve bought a new bath toy, so many of these might be on our Christmas list this year! Boats Both these boats and these ones are top sellers for being easy to clean and not trapping water. BOON JELLIES!!!! These are super fun and highly recommended. Sail Away Shapes These are ADORABLE and also educational for matching up shapes. Many moms say these are the best bath toys they have owned. 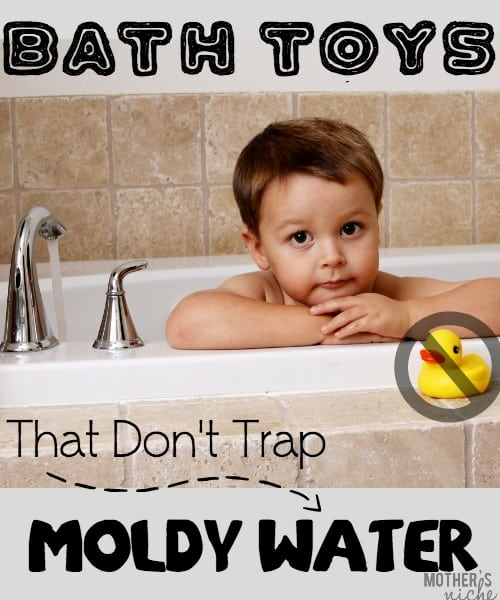 What are your kid’s favorite bath toys that don’t trap water inside? I always get so grossed out with the squirt toys. I don’t wanna know what mold is lurking in there! Check out the easy clean bath toys from Sago Mini. They open up so you can drain them!